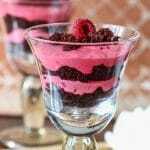 Chocolate Raspberry Parfait is an easy dessert that anyone can do! 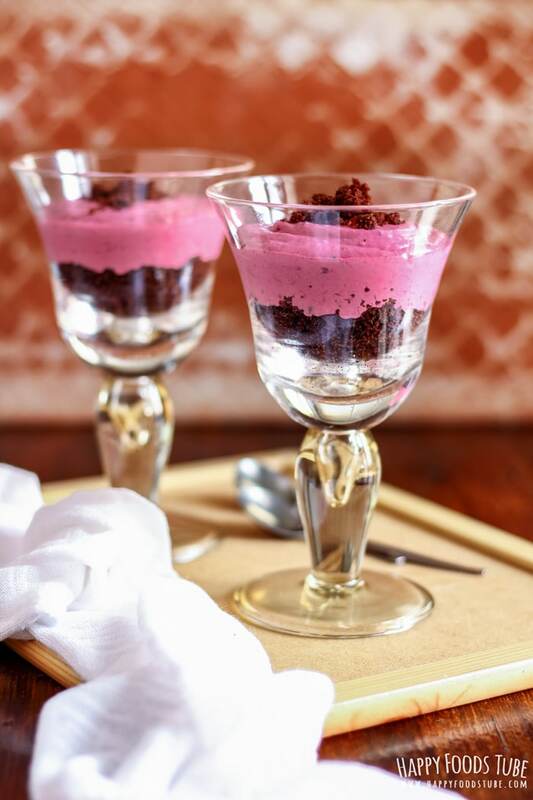 Moist chocolate cake and creamy raspberry mousse layered into glasses will definitely be a hit at your dining table! Looking for fun and easy desserts for kids, Valentine’s day or a romantic dinner? This chocolate raspberry parfait is the thing! 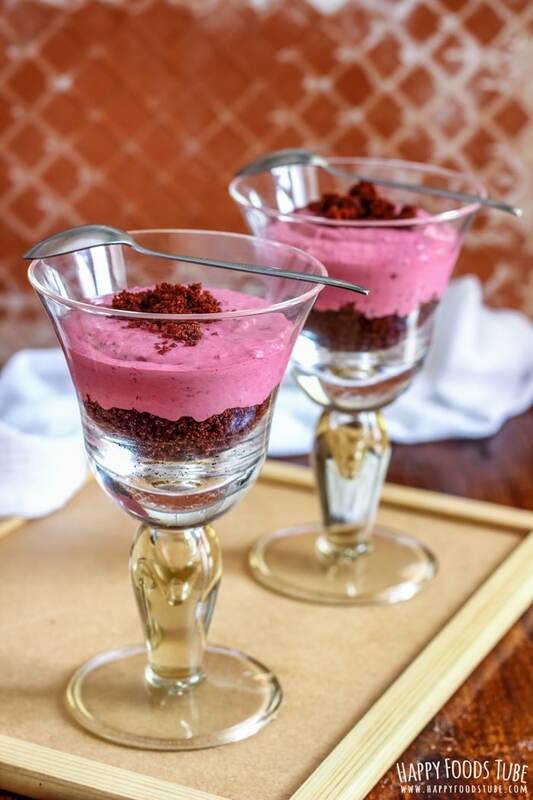 Grab nice glasses, fill them with chocolate cake crumbs and raspberry mousse and garnish to your liking! 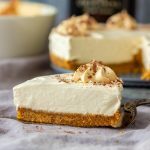 Easy preparation – this is one of those desserts that anyone can do. So guys, if you have an oven and a cake pan – you should give it a go! Perfect baking project for kids – the best part about this sweet treat is that you don’t really care what the cake looks like because you will turn it into crumbs! So perfect for kids! 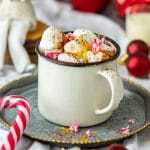 You can make the cake the night before and finish the dessert cups the following day. The raspberry mousse takes about 5 minutes to make (I’d say even less than that). 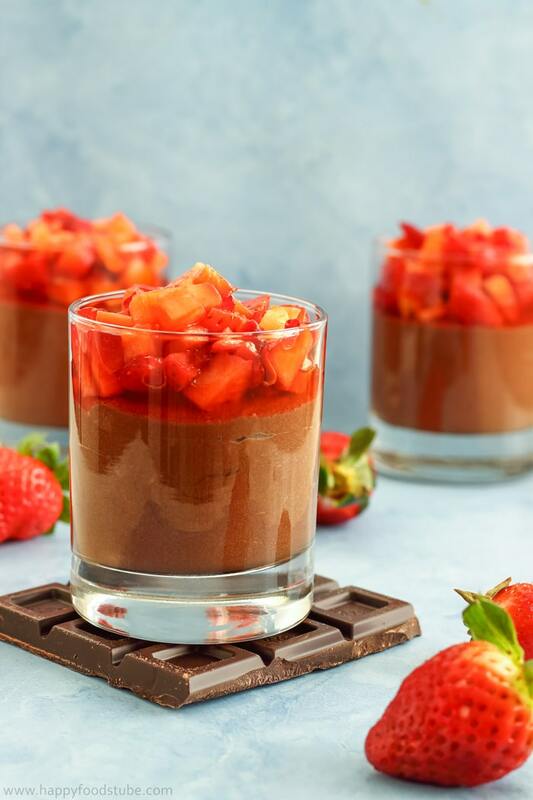 Chocolate raspberry parfait is a versatile dessert – use strawberries instead of raspberries, add garnish of your choice (chocolate shavings, fresh raspberries, …), add more sugar (or less), make the mousse thinner by adding more berries or create more/less layers! The options are endless! 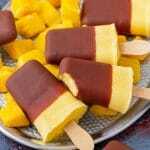 This dessert is very easy to make. In fact, there is nothing to do wrong here. First preheat the oven. Meanwhile whip up the batter for the cake. Yes, we will bake a cake and then turn it into crumbs. You don’t need a mixer so as long as you have a bowl, a sieve and a wooden spoon (actually you can use a spoon as well) you are good to go. Sift the flour, baking powder and cocoa directly in your bowl. Add salt, sugar and give it a god stir. 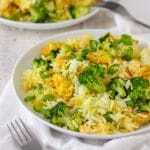 Now add the wet ingredients – milk, oil and egg and mix everything until well combined. 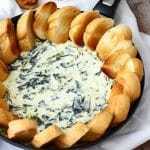 Pour the batter into a cake pan of any shape. I used an 8x8inch (20x20cm) square cake pan and this is about the size you are after. There cake will be enough for 4 good size portions. The baking time will be around 20 minutes. Just make sure an inserted skewer or toothpick comes out clean and you can take it out from the oven. Let the cake cool down completely before turning it into crumbs. 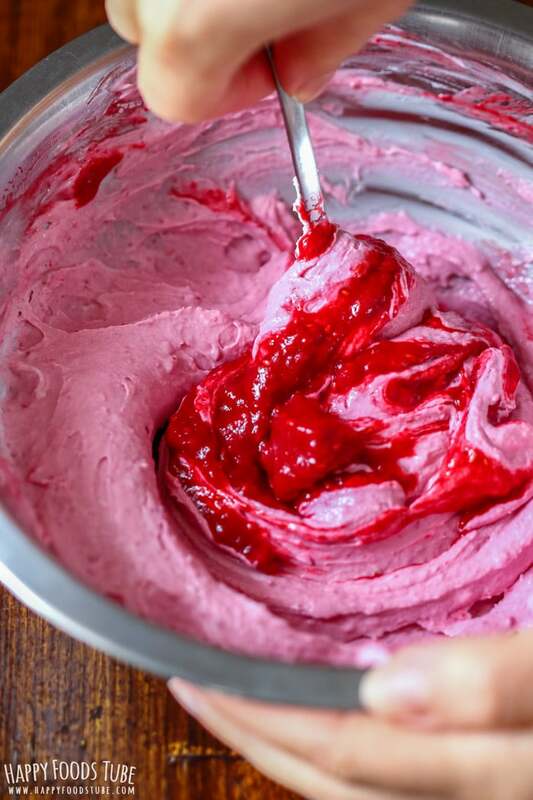 Either you whip up the raspberry mousse while the cake is in the oven or you can do it while waiting for the cake to cool down. For the mousse just combine fresh or thawed raspberries with the mascarpone and some powdered sugar. 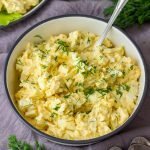 Easy-peasy yet delicious! Now to turn this into mouth-watering chocolate raspberry parfaits get some glasses and fill them with the cake crumbs and raspberry mousse. It is completely up to you what way you arrange these in the glasses. 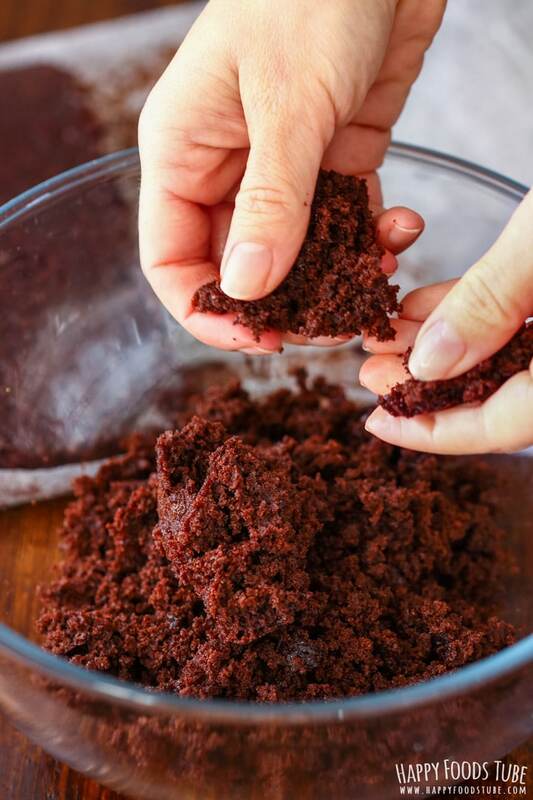 For the chocolate cake: Sift the flour, baking powder and cocoa powder into a bowl. Add sugar and mix everything with a wooden spoon. Pour in milk, sunflower oil and the egg. Mix this until well combined. Pour into 8x8 inch (20x20cm) cake pan lined with a sheet of baking paper. Bake in a preheated oven at 356°F/180°C for 15-20 minutes or until an inserted skewer comes out clean. Let it cool completely before crumbling it with your hands. For the raspberry mousse: Using an electric mixer, combine the berries, mascarpone and powdered sugar until smooth. 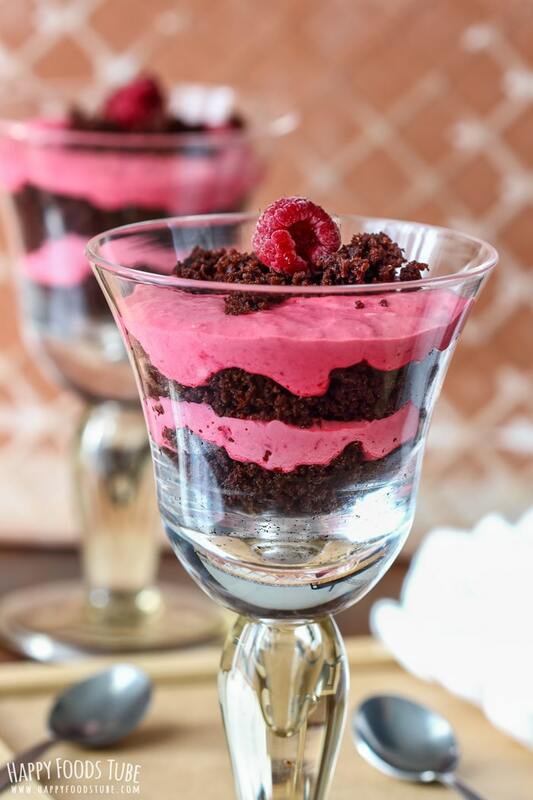 Fill glasses with layers of the chocolate cake crumb mix and raspberry mousse and garnish to your liking (i.e. fresh berries, chocolate shavings). Eat right away or chilled. 1. 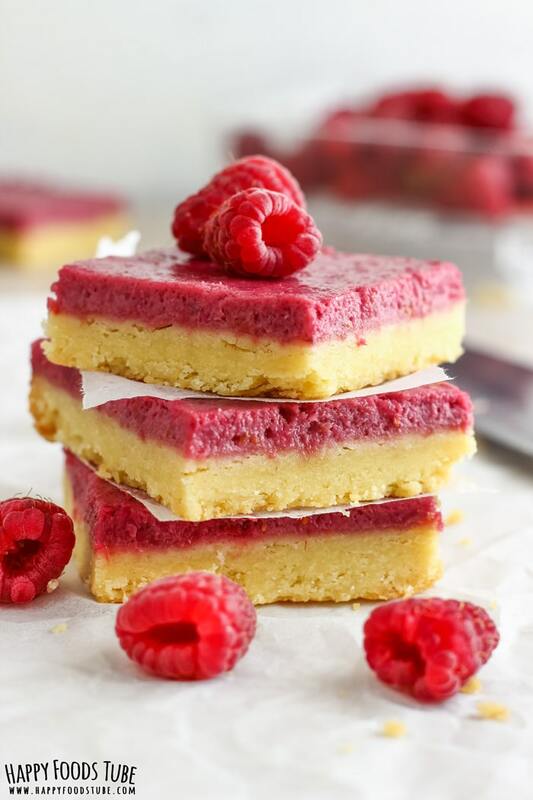 This recipe is versatile so you can adjust the amounts to your liking - thin the raspberry layer by adding more raspberries or top these with chocolate shavings, fresh raspberries, create more layers or use strawberries. 2. The cake will be enough for 4 glasses (8oz/250ml each). If you don’t use up all the cake, just wrap it in cling film and freeze for later use. In this case divide the raspberry mousse ingredients in half. 3. 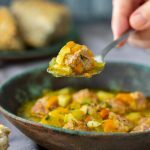 This recipe can be easily doubled. 4. You can use fresh or frozen raspberries (let them thaw before processing). 5. 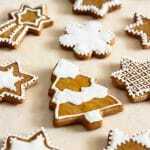 Powdered sugar – you can increase or decrease the amount of sugar to your liking. 6. Turn this into a no bake dessert by using Oreo cookies instead of baking the cake. 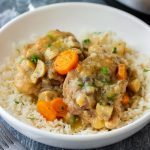 These are SO sweet, and would definitely be a great project for kids in the kitchen – spooning and layering are two of my son’s favorite jobs. :) Plus I’m drooling over that mousse! Oh, I have some leftover chocolate cake that would be perfect for this recipe!!! I can’t wait to make that raspberry mousse it sounds so wonderful!!! Off to the kitchen! YUM! Perfect! Let me know how you liked it! Woah this parfait looks so good! I love the color combination ♥ Perfect for Valentine’s day! 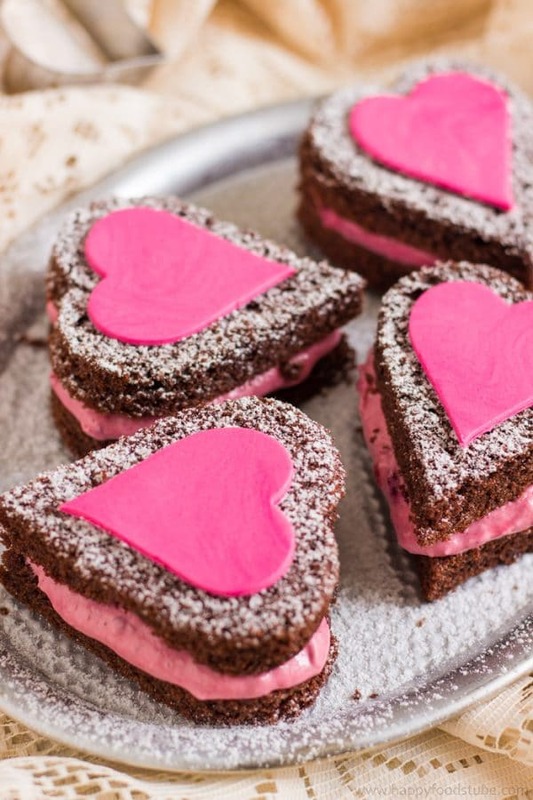 These look absolutely perfect for Valentines Day – I may have to make these with my girls! What an easy and elegant dessert!! I love desserts like this! I’ve found what I’m making for Valentine’s Day! Thank you, Pam! :) Enjoy! I love how easy it sounds for a fancy-looking treat! Raspberries are some of my favorite fruits, yum! Can I do these a night before or will the bread soak up the mousse? Veronica, it’s best to assemble the parfait on the day you want to serve it BUT you can make the cake and the mousse ahead. Wrap the cake in cling film (so it doesn’t dry out) and cover the mousse as well. It only takes a few minutes to put them together. Hope this helps. Thank you. 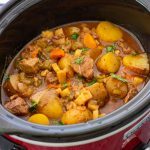 I’m happy I found this easy recipe. 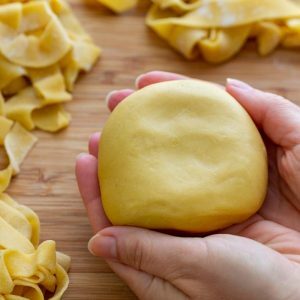 My two year old always wants to help in the kitchen and this is the perfect recipe for us to make together. This looks scrumptious! I love how easy this can be done and the many options to do this. A good way to bond with kids, perfect for any occasion too. 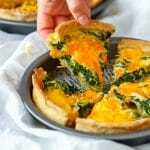 Hi, how can I change this recipe to none dairy and can I freeze it after layering? I am afraid I won’t be able to help you, Lir. 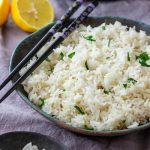 I haven’t tested this recipe with non-dairy products. I also don’t recommend freezing this dessert. You can freeze the cake itself, then defrost whenever needed. The raspberry layer might not taste nice when defrosted. Hope this helps.